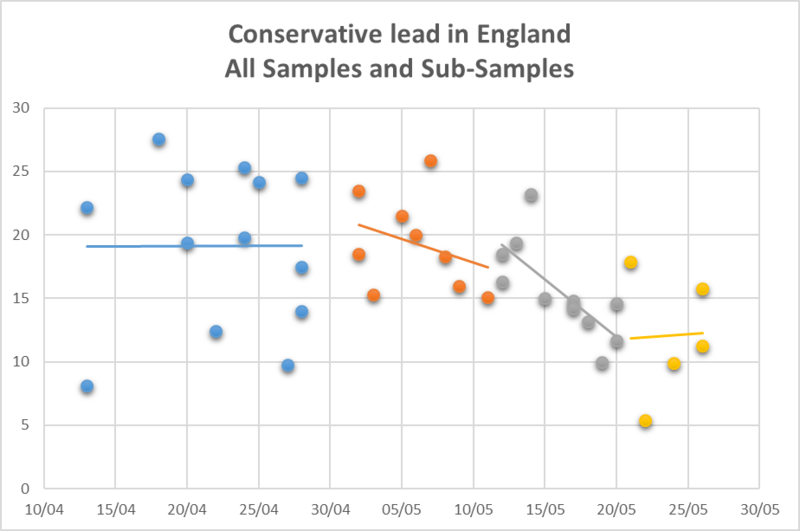 We continue to see evidence that the Labour surge is receding and that Conservative support is recovering. Our analysis indicates that Conservative support is now moving upwards in all three major regions (England, Scotland, Wales) with particular improvements in Scotland and Wales, where Tory support is back to the level of ten days ago. In Scotland in particular there is evidence that the increase in support for the Conservatives may take them within distance of winning many SNP seats. This majority assumes 5 Sinn Fein MPs who will not sit in Parliament.